Sandals & Beaches Are On Sale. These two resort chains are putting on some impressive sales. -65% off of their Ocho Rios resort in Jamaica plus a $250 spa credit AND free nights in select categories. -Up to 60% off on resorts in Jamaica, Bahamas, St. Lucia and Antigua, plus additional FREE nights in select categories. 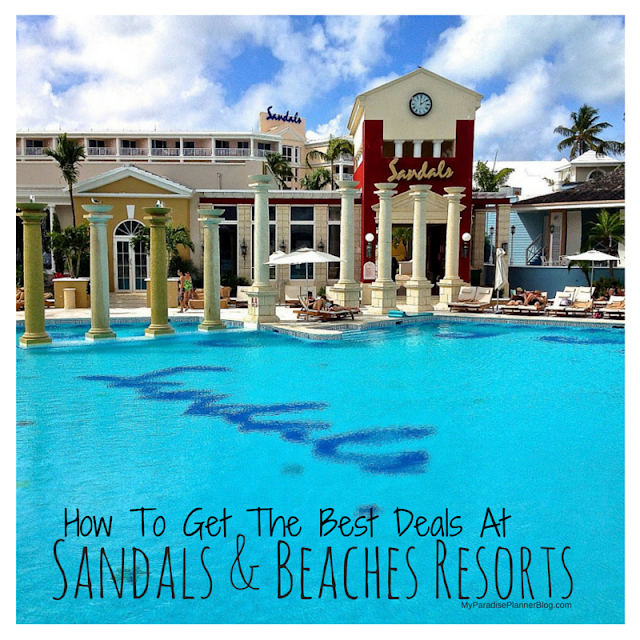 Sandals is known for their "couples only" policy and their motto, "Love is all you need". I'm sure you've seen the commercials with the perfect looking couple on the perfect looking beach with the butler, drinking their delicious looking fruit drink while laying on the lounge chairs that are half in the ocean, half on the sand. It's the perfect setting to rekindle your love for one another, and a great place to have a honeymoon or anniversary trip. We know, we've been there, and even after traveling to other places, our Sandals experience can't be beat. -Up to 60% off of their 3 resorts in Jamaica and 1 in Turks & Caicos, plus TWO free nights in select categories. If you thought Sandals had it right, Beaches has it all. All the amenities that Sandals has and more. The fact that it is a family friendly resort means that there are lots of added activities for children including an Xbox game room, a teen disco club, teen-only excursions like snorkeling and party boats, day cares, water parks, and so much more. In fact, we talk to families who have visited Beaches with their kids and they saw their kids at check in, for dinner every night, and check out. It's a truly amazing retreat for families with kids of all ages and the prices can't be beat. Plus, right now Beaches has a few deals going on. Mother's Day fun- Celebrate mother's day by treating your mother to an all-inclusive trip to Jamaica or Turks & Caicos. Travel is only valid from May 1st- May 31st so book now. Grand Opening Sale- Beaches Turk & Caicos is celebrating the opening of their new Italian Village and rooms are already on sale! Join them for this big event that's up to 60% off. Best Friends Forever- Planning a girlfriend's getaway? Go to Beaches and get a discount for bringing your group of girlfriend with you. A 4 night trip, including rooms and everything mentioned below, also includes $200 credit for spa treatment, and a boat trip for just you and the girls. They will also put together a welcome cocktail reception, Caribbean cooking class, wine tasting, a beach bonfire pajama party, beach yoga and seaside pilates classes just for you gals, and a farewell dinner. -All meals and snacks, all day long, at any time. Most resorts boast 3 or more dining options (restaurants and bars and grills). Meaning, if you want ice cream for breakfast, ask for it at no additional charge. Popcorn at 2am? No problem. If you want lunch two times in the same day, go to two restaurants in one afternoon, no questions asked. You get the hint. -All drinks (both alcoholic and non-alcoholic). Meaning you can drink pina coladas until your brain freezes. Or you can drink soda all day long whenever you want. Also, your room is equipt with a mini bar full of alcoholic and non-alcoholic drinks. -24 hour room service (in select categories). Meaning if you are hungry at 5am, order room service at no additional charge. -All activities. You can hop the excursion boat and go snorkeling with your resort's trained watersport staff. Or you can play tennis all afternoon. Or windsurf, kayak, and ride the water bikes. Or if you are a certified scuba diver, you can go on diving excursions for free. Even golf is included! -Transportation from airport to hotel, and back again. Your round trip transportation is included in your package price. Meaning no waiting for a taxi to take you to your resort. It's there waiting for you when you get off the plane, and will take you back to the airport the day you leave. -Tips. There is a "no tipping" policy at Sandals and Beaches. Your gratuity is added into the room package so all the amazing service you get while you are there is already paid for. Some additional included amenities are toiletries, robes, umbrellas in your room in case of less than perfect Caribbean weather, in room safe, flat screen TV's with cable channels, and some suites even have a jacuzzi and BUTLERS to help make your vacation not only luxurious but completely unforgettable. Our trip to Sandals Negril was pure heaven. Just take a look at the picture below. I took this one afternoon from the edge of our bed! Amazing location, amazing view, amazing amenities and services. Everyone has to go at least once. $200 Air Credit To The Bahamas!